My family and a friend came for afternoon tea this afternoon. We found you on the internet because we are not local to Tunbridge Wells. And what a find! We had a lovely time; the food was delicious, the atmosphere great and the service was excellent. We will be back! Thank you. I would like to enquire about renting the space above your deli for Silver Clay classes. We met briefly at a networking event and I haven’t forgotten you. I think you deli is lovely and would like to know costs as I have very little spare cash for hire which is a pity. In general I run a ‘taster’ course that runs to approx. 4 hrs and I intending to introduce the Day long Silver clay class and possibly s coppery clay Day class. On the classes we will make use of the available tea/coffee and food on offer, normally I suggest the closest venue as time is short. I am hoping to do the Appleduck Valentines weekend event, where I would push the courses and hope that perhaps you lovely deli can be included on my venues. We arranged a birthday tea party for my 9yr old daughter, the children had a wonderful time, the afternoon tea provided was amazing and delicious and the staff were attentive and helpful. I highly recommend Juliet’s and will be returning myself in the near future. Thank you for making my daughters birthday celebrations so memorable. Hi, I just wanted to give some feedback re: a cream tea my daughter and her friends had today. 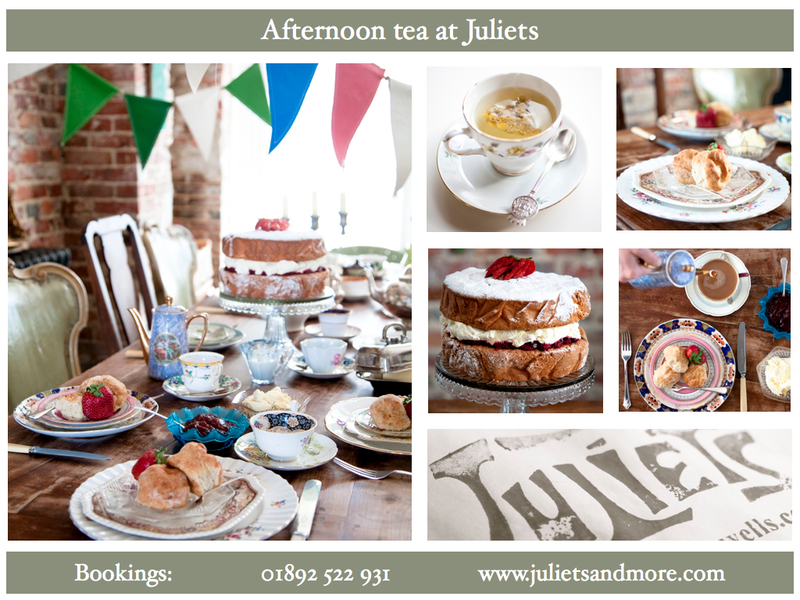 We have had afternoon tea at Juliet’s before and have thoroughly enjoyed the sandwich selection which have been a great mix of flavours all freshly cut ,gorgeous scones and scrumptious cakes . Sadly ,today the sandwiches were a strange mix of fillings!! trout, beetroot and coronation chicken eeeuurg!! The girls had to request different flavours ! !